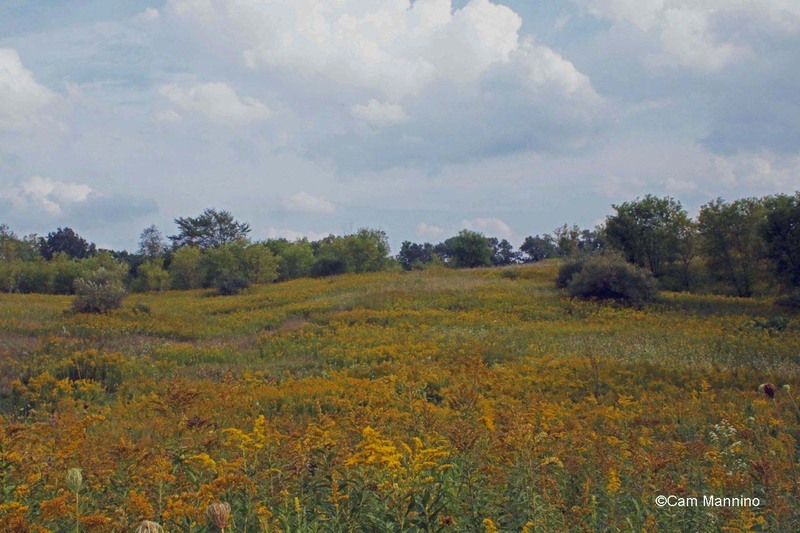 The golden western slope of Bear Creek from the northern end – full of Monarch butterflies this week. Open fields edged by trees have always been favorite places of mine. And this Tuesday,in the fields on either side of the park, Monarch butterflies were everywhere! 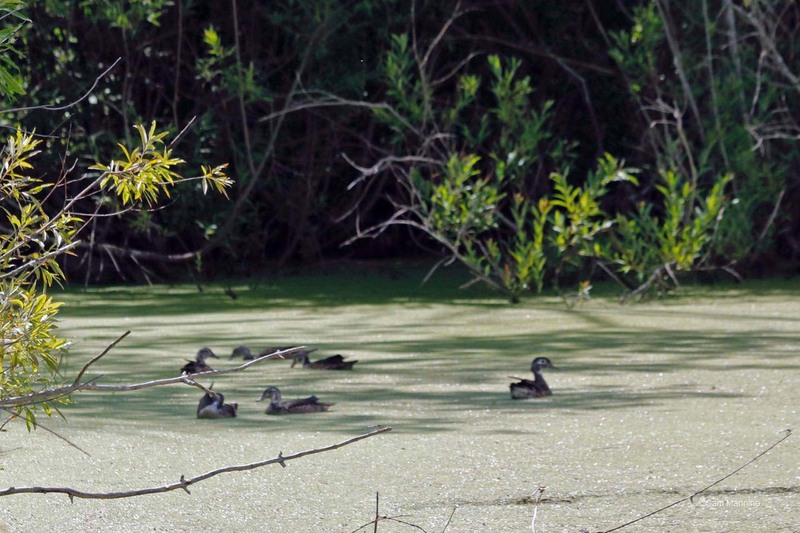 Bear Creek may be hosting fall migrators on their way to Mexico – or we’ve just had a big hatch of these beautiful and ecologically fragile creatures. 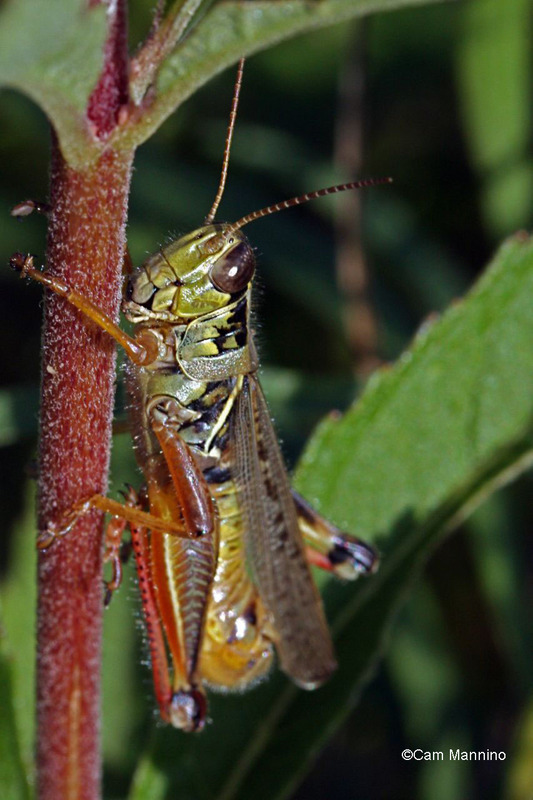 In fact, many butterflies, bees and darners fluttered, hummed and hovered over the swaying seas of gold in Bear Creek, while grasshoppers serenaded them beneath the tall stems. Some speculate that humans love open fields because our ancient ancestors felt safe where they could see into the distance but escape into the trees. I just know I’m very happy in a field full of wildflowers. First, of course: The Monarchs and the Hummer! After only seeing the occasional Monarch Butterfly (Danaus plexippus) this summer, on Tuesday they were floating and fluttering all over the park! 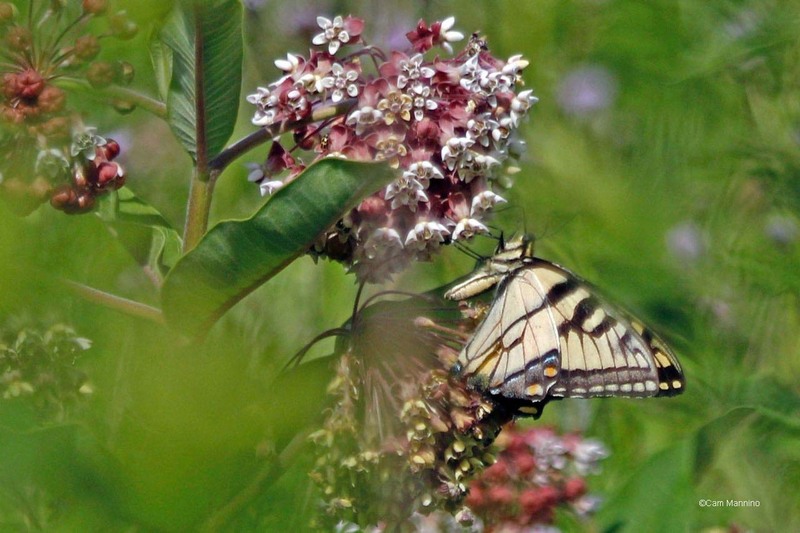 Though the Joe Pye (Eutrochium maculatum) in the Eastern Old field seems to be past its peak, its nectar drew in a Monarch (and other butterflies below) anyway. 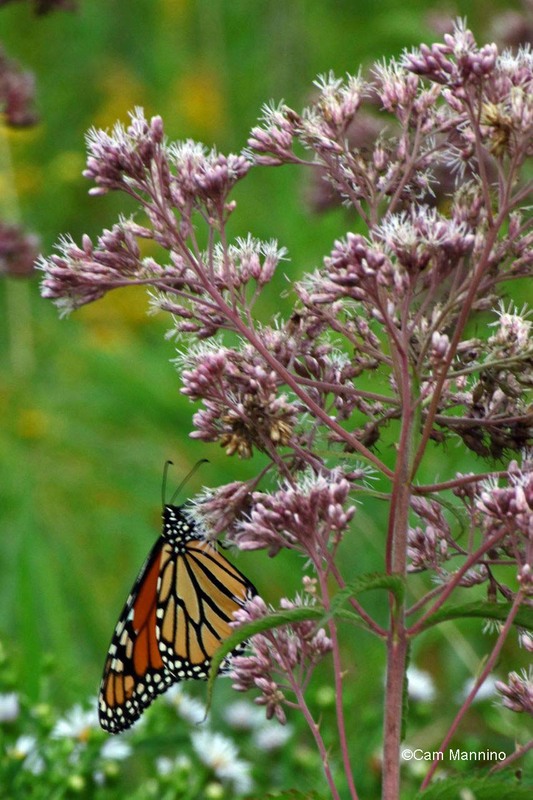 A monarch explores the fading Joe Pye for a sip of nectar. I considered myself lucky to get so close – but when I started down the Western Sloping Path from north to south, wow! Monarchs surrounded me every step of the way. I believe I saw at least a dozen there, but I’ll share just a few who were enjoying the New England Asters. 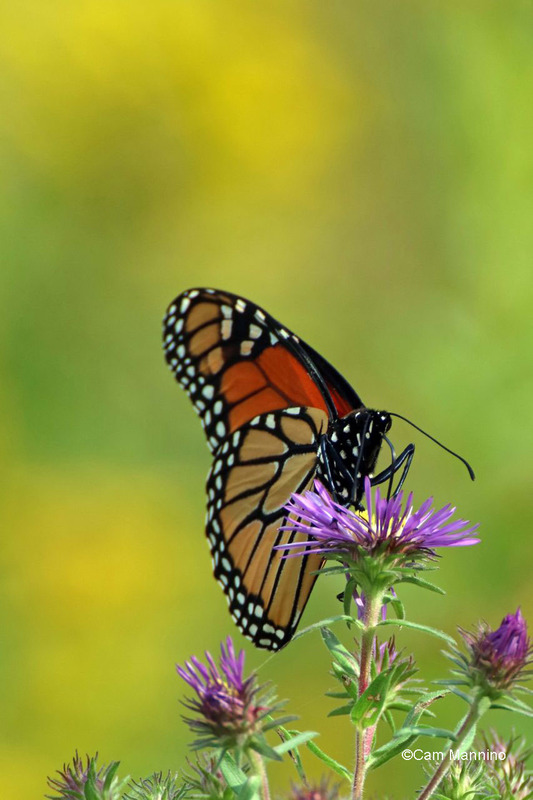 A female Monarch butterfly dangles from a clump of New England Asters. At the very bottom of the sloping path, I watched as two Monarchs approached and fed on the same plant. 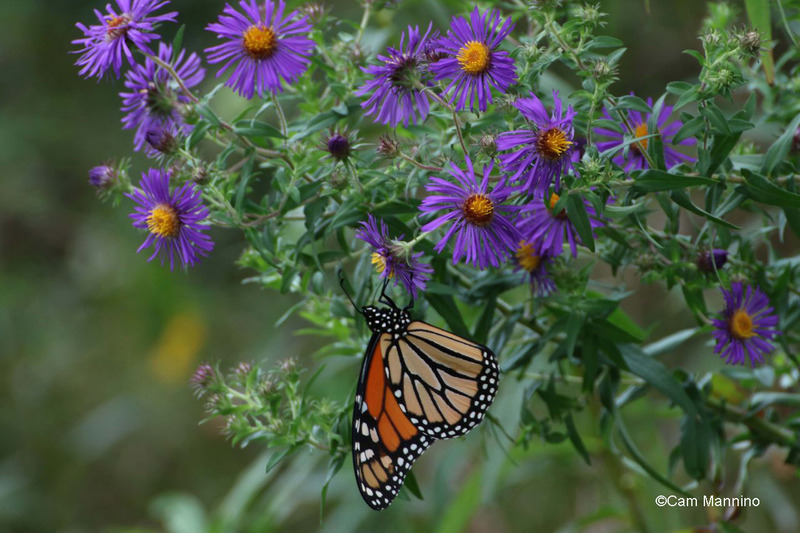 Two monarchs share a New England aster plant. 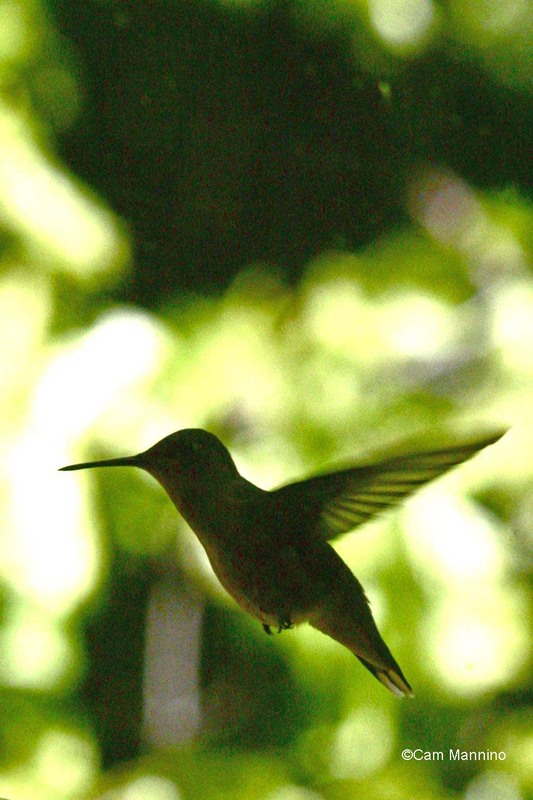 Just at that special moment, I saw the second Ruby-Throated Hummingbird (Archilochus colubris) I’ve ever seen at Bear Creek – a female, hovering momentarily as she looked at me and then zoomed off toward the woods. No photo, of course, but perhaps this silhouette of a hummer in mid-hover from a few years ago will help you visualize the one I saw this week. Eastern Tiger Swallowtails (Papilio glaucus) fluttered quickly across the golden fields. I just caught sight of one in the far distance on the Eastern Path on Sunday so here’s a picture from another August, when a male landed on Spotted Knapweed, an invasive wildflower. 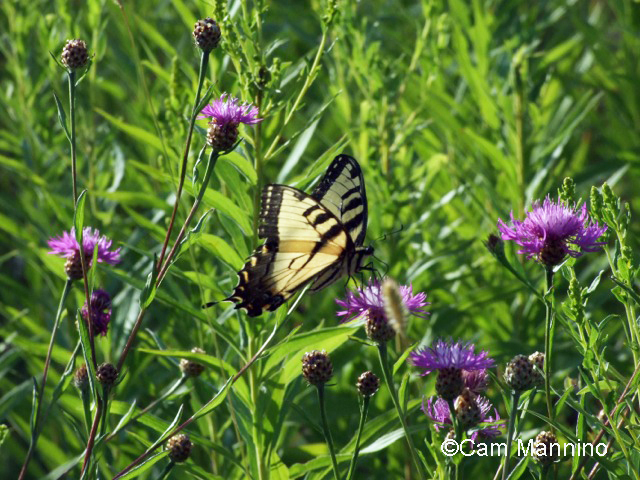 A Tiger Swallowtail lands on Spotted Knapweed, an invasive wildflower from Eurasia. 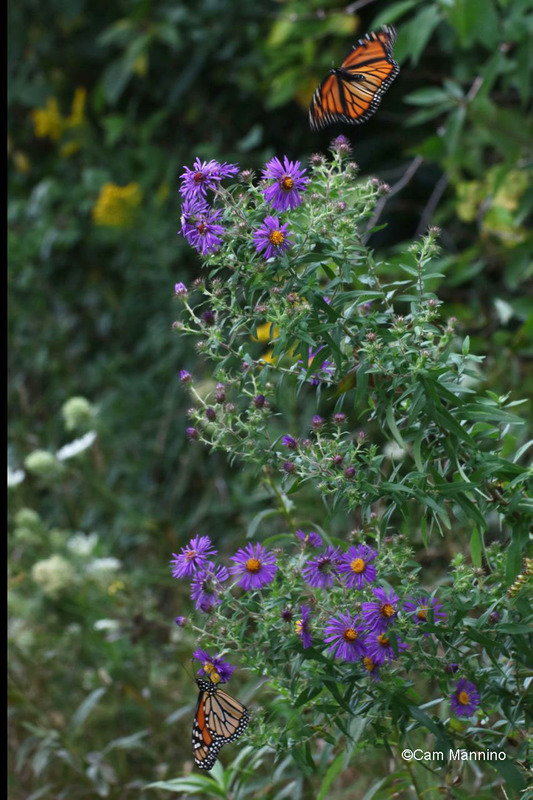 New England Asters (Symphyotrichum novae-angliae) increasingly complement the Goldenrods’ glow as these vivid native flowers grow tall to reach their share of the thinning sunlight. 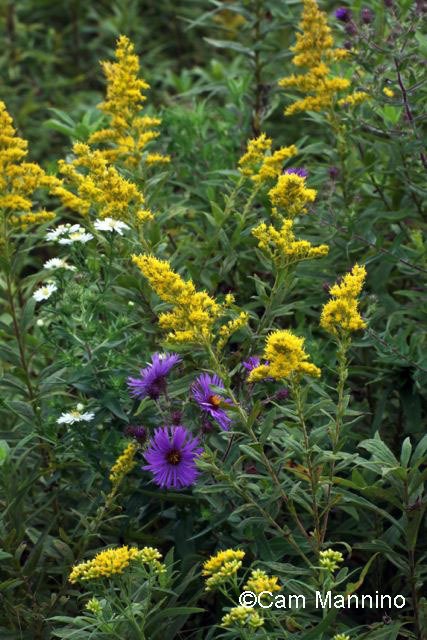 Asters have grown tall this year competing with the height of Goldenrod and complementing its color. A Great Spangled Fritillary in the Eastern field paused on fading blossoms of Joe Pye to take a sip, just like the Monarch did. 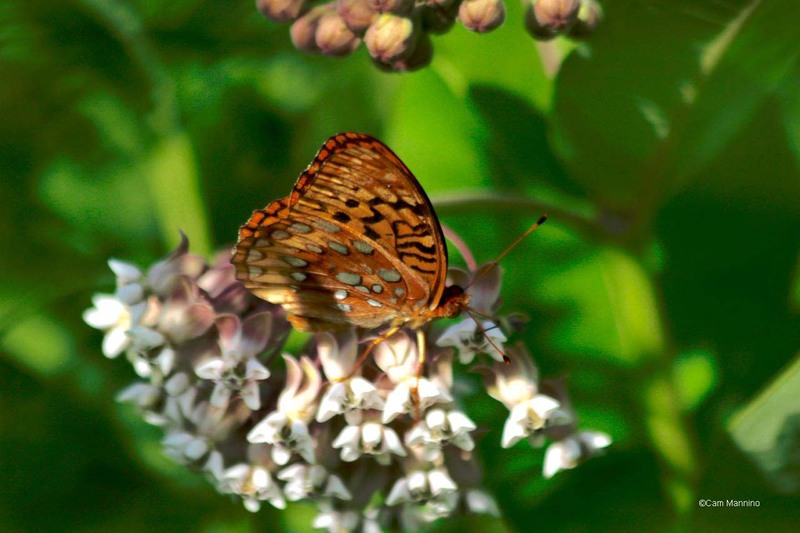 A Great Spangled Fritillary pauses to sample the fading blossoms of Joe Pye Weed. And the Silver-spotted Skipper (Epargyreus clarus) rested beneath a blossom of the same plant. 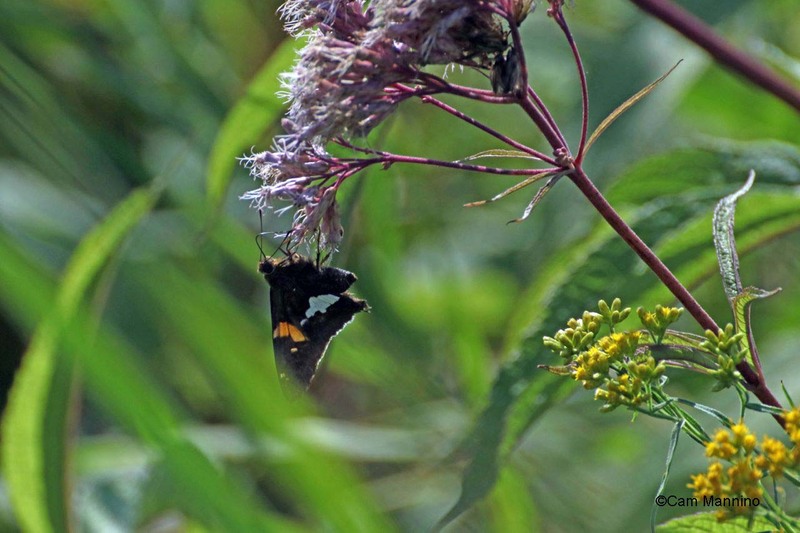 A Silver-spotted Skipper explores the possibilities of the Joe Pye by hanging from a fading blossom. Honey Bees (Apis mellifera), native Bumblebees (genus Bombus) and even Eastern Yellow Jacket Wasps (Vespula maculifrons ) hum among the flowers in the Old Fields. Don’t worry; they’re much too busy gathering pollen, or in the case of wasps, eating nectar, to bother with us humans. 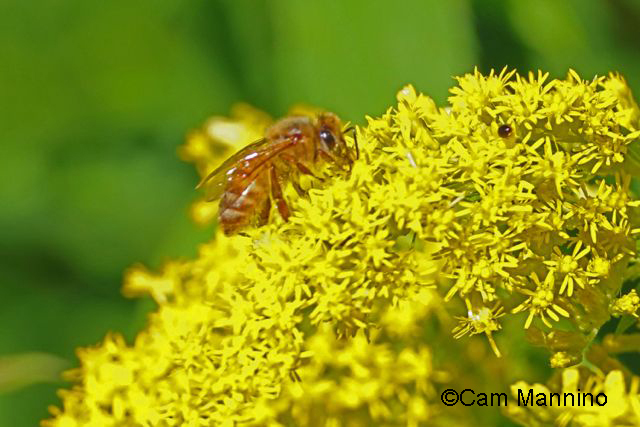 A Honey Bee making the most of late season pollen on a Canada Goldenrod. Always on the lookout for a quick munch, the big Canada Darner Dragonfly (Aeshna canadensis) zooms and dives over the blossoms below. This B-52 of insects consumes a lot of late summer bugs. 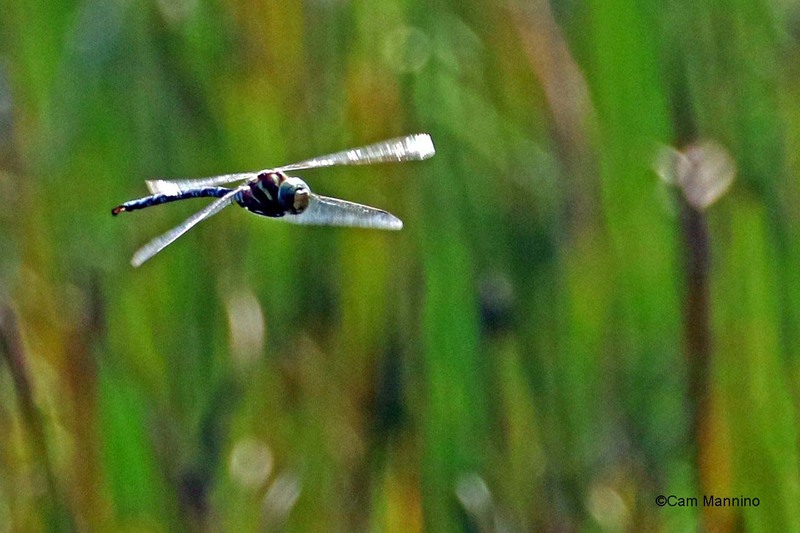 A Canada Darner flew over the reeds next to the Eastern Path, scouting for unwary insects. 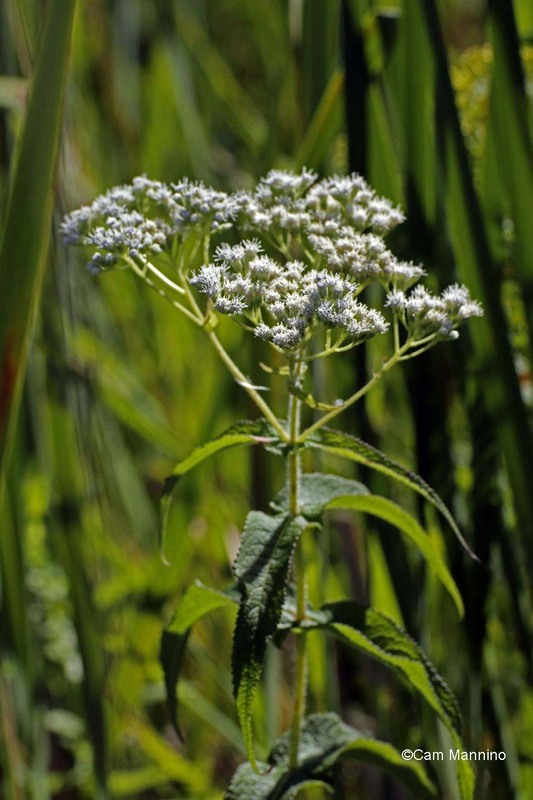 Reportedly Boneset got its name from a past belief that because the leaves clasp the stem, it would help with mending broken bones. Down in the grass, the Red-legged Grasshoppers (Melanoplus femurrubrum) sing lustily as a backdrop to all this beauty by rubbing their rasp-like back leg against their forewing. Red-legged grasshoppers chirp in the grass, preparing to mate and lay their eggs in the soil for next year. 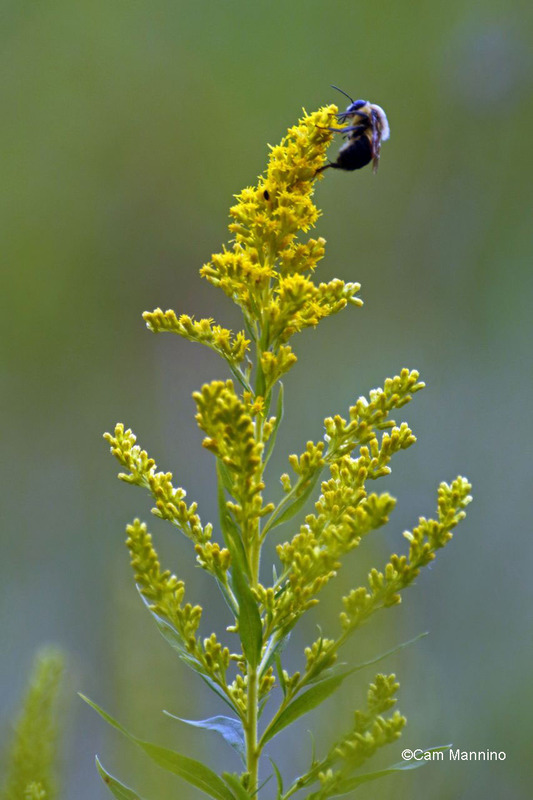 A bumblebee balancing on the tip of a Goldenrod stem. Yellow Jackets, like all wasps, don’t do much pollinating because they lack the fuzzy body hair of bees. They generally eat nectar but collect bugs for the protein they feed to their young. 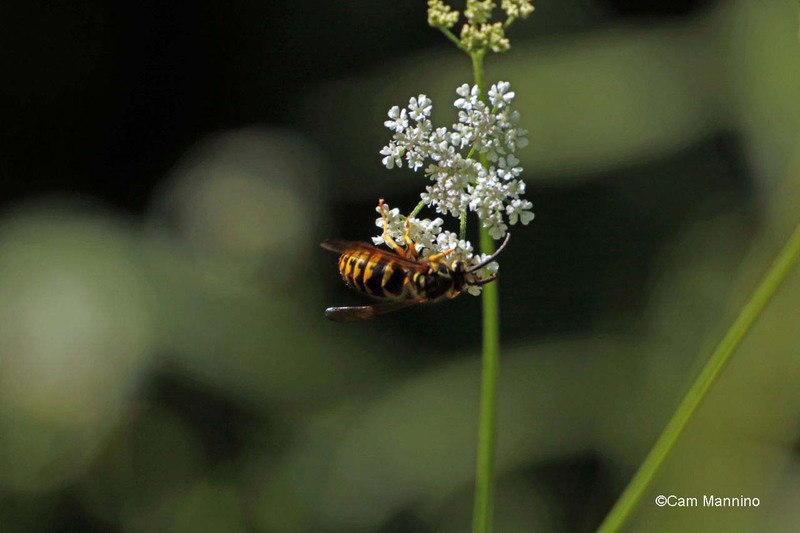 A Yellow Jacket Wasp explores a tiny blossom of Queen Anne’s Lace. 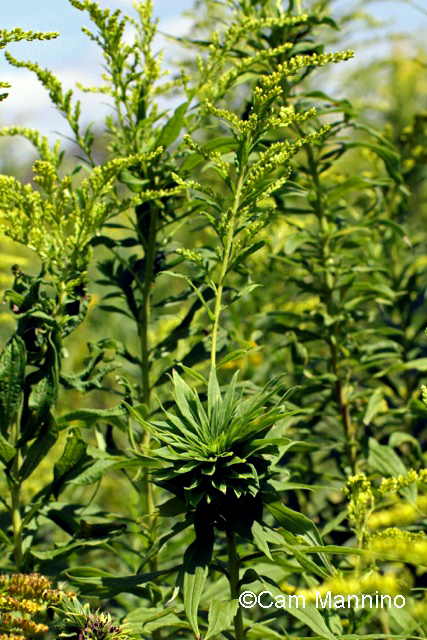 What’s That Bump on the Goldenrod, Anyway? As you’re wandering through the Old Fields, you may have noticed some strange shapes on the stalks and tips of Canada Goldenrod (Solidago canadensis). Galls are growths on plant stems caused by insects who lay their eggs on the plants in the spring. When the larva hatch, they eat into the plant, causing it to form a gall around them. Inside, the larva eats until late summer when it forms a pupa which spends the winter inside that protective covering. 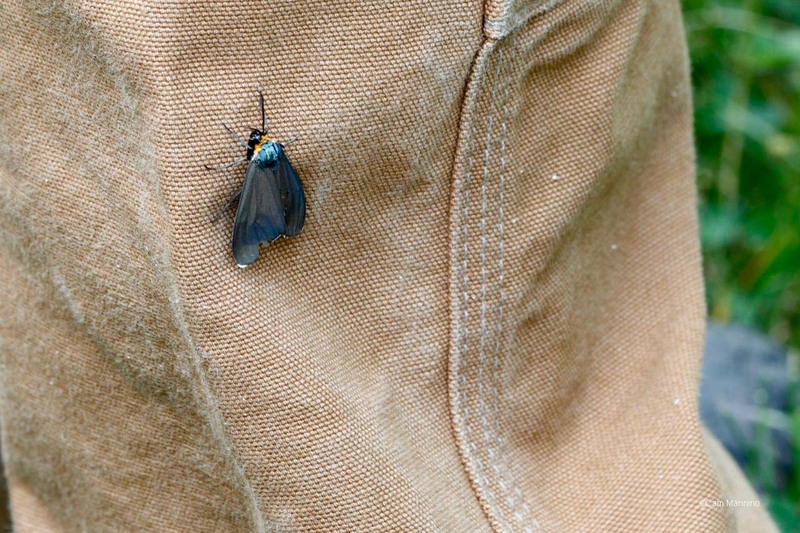 In spring, the adult insect emerges to restart the life cycle. Galls don’t kill the Goldenrod; they just look funny! 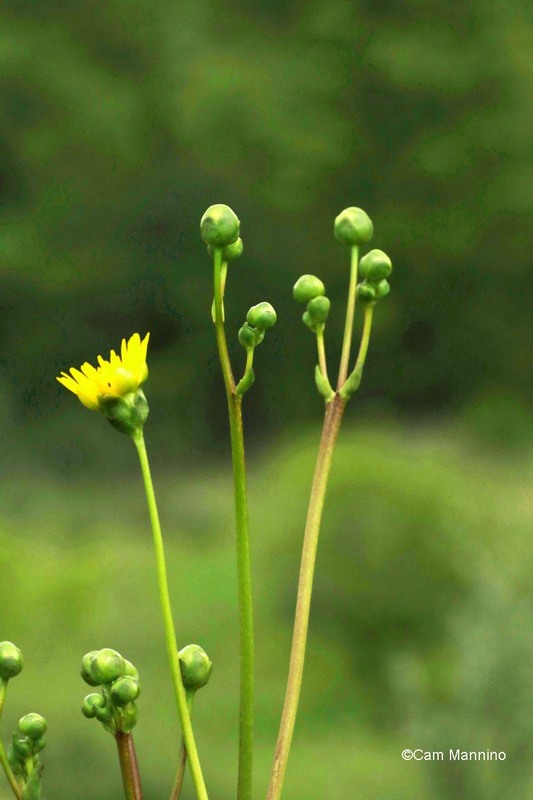 The ball gall is the most common goldenrod gall and is formed by the small Goldenrod Gall Fly (Eurosta solidaginis). With its hard surface, this gall seems like a decent place to spend the winter, doesn’t it? During the summer, though, some wasps lay eggs in galls and their larvae hatch and make a meal of the gall fly’s. And in the winter, Downy Woodpeckers drill holes in galls to reach the pupae, and Gray Squirrels chew on galls to do the same. Obviously enough Gall Flies survive in these dwellings to start a new crop next spring, so nature stays in balance. I think this gall may have been invaded by a wasp. 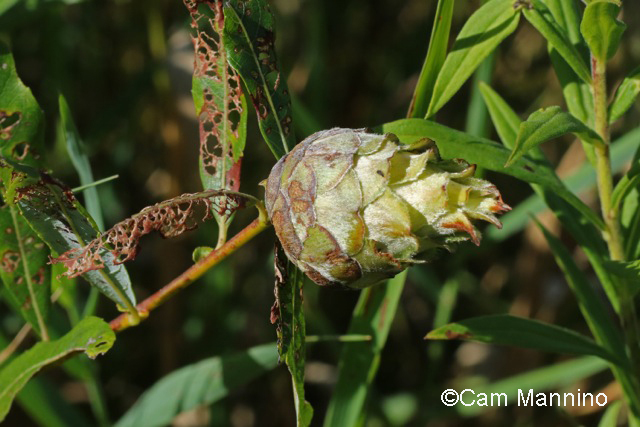 A ball Goldenrod gall formed by the larva of a Goldenrod Gall Fly who turns into a pupa and spends the winter there – though the holes indicate that perhaps a wasp has invaded this gall and its larva may have eaten the gall fly’s. 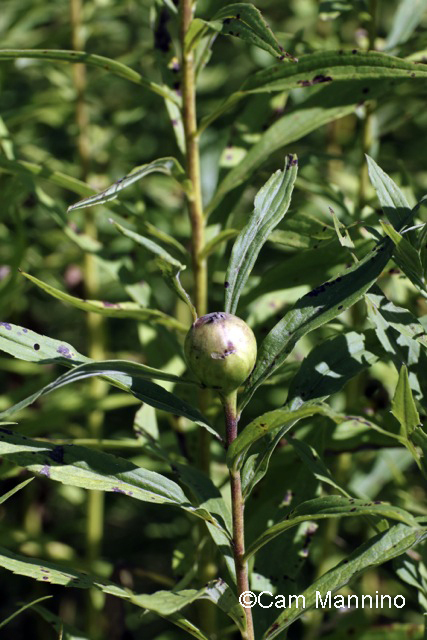 Goldenrods also harbor the very tiny (.2″) Goldenrod Gall Midge (Rhopalomyia solidaginis) which causes a rosette gall. 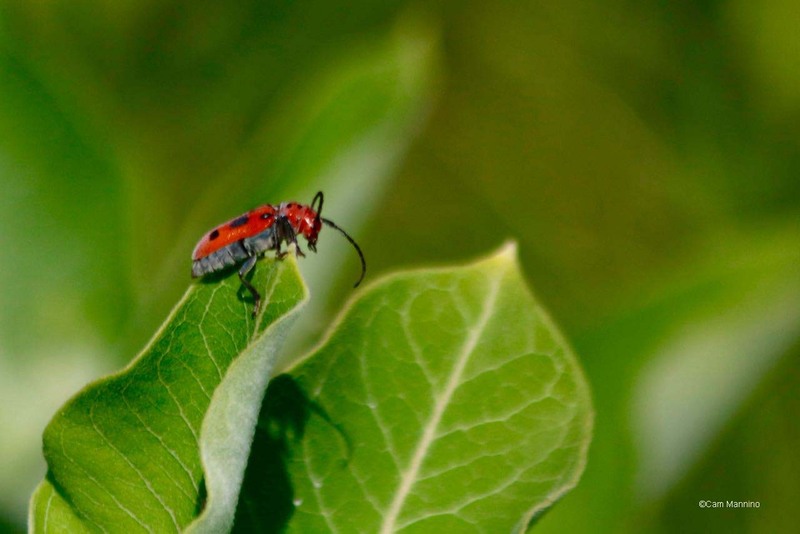 Once the grub of this tiny creature hatches, the stem of the goldenrod generally stops growing but keeps producing leaves which bunch up and make a nice hiding place for a midge’s larva to grow – along with spiders and other midges who may move in. Sometimes, as in this photo, the stem will continue to grow above the rosette gall, but it’s much more spindly. A rosette gall on Canada Goldenrod created by a single tiny insect but potentially a hiding place for other midges and spiders as well. For years I saw willows in the park that seemed to be producing pine cones at the end of their branches. Turns out they’re Willow Pine Cone Galls, made by a tiny (about .2″) midge scientifically known as Rhabdophaga strobiloides. The pine cone-shaped gall that its larva causes can harbor many species. 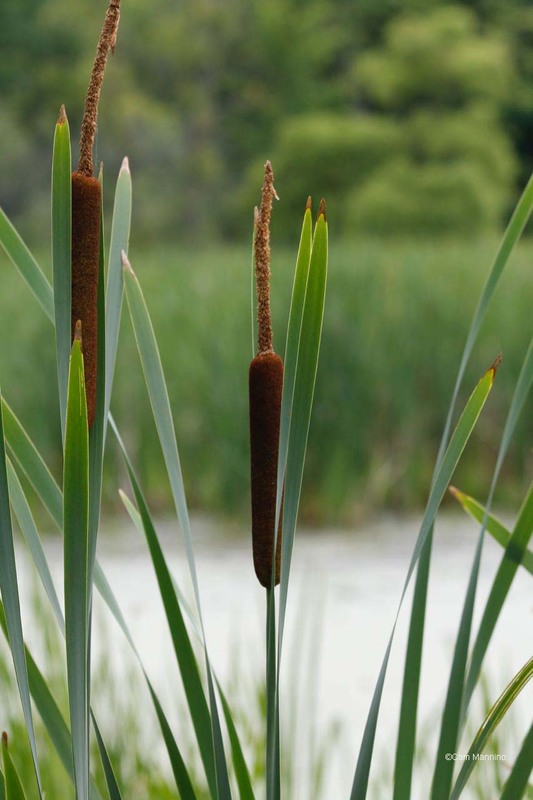 According to the University of Wisconscin-Milwaukee’s Field Station website, “Beetles, caterpillars, sawflies, cynipid wasps, midges, and the eggs of meadow grasshoppers have been found inside pine cone galls.” They’re now on a willow on the west side of the Center Pond and can also be seen in the wetland area east of the Eastern Path. No, not a pinecone! A Willow Pine Cone gall that can harbor over 30 different species besides the larva of its original midge. The Eastern Old Field rolls down to the Center Pond and the Western one slopes dramatically to the west. The trails that wind across them are full of strange and beautiful creatures and the plants that feed on and live in them. Walk quietly. Look closely. Listen carefully. And when nature shares a secret with you, please share it with the rest of us. 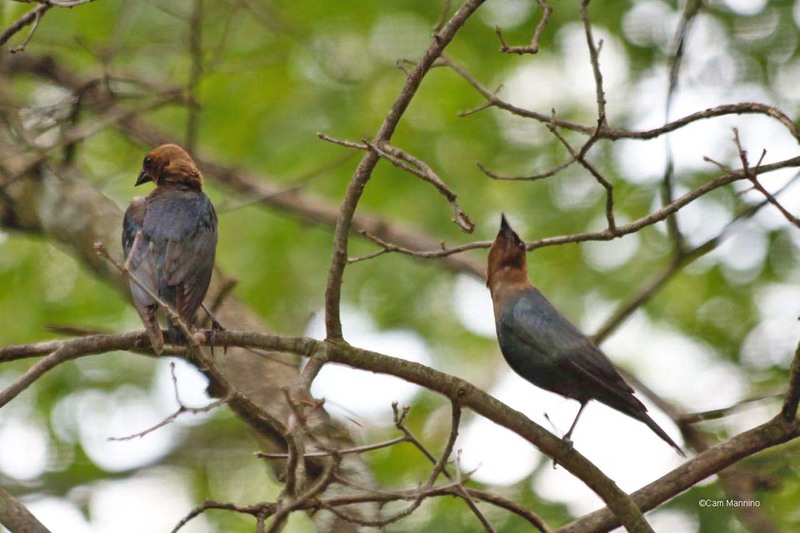 The Walnut Lane in the center of the park is a hangout for avian adolescents this time of year. Every few feet you hear or see another fledgling sparring with siblings, practicing a song or poking about for food on their own as their tired parents retreat from constant feeding. 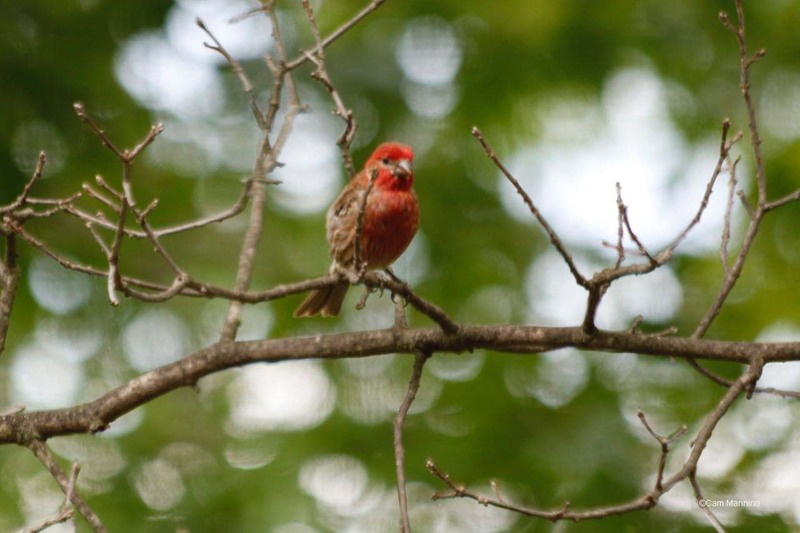 Below I’ve provided links to Cornell Ornithology Lab photos of the adult birds so you can see how the juveniles differ from the adults in appearance. 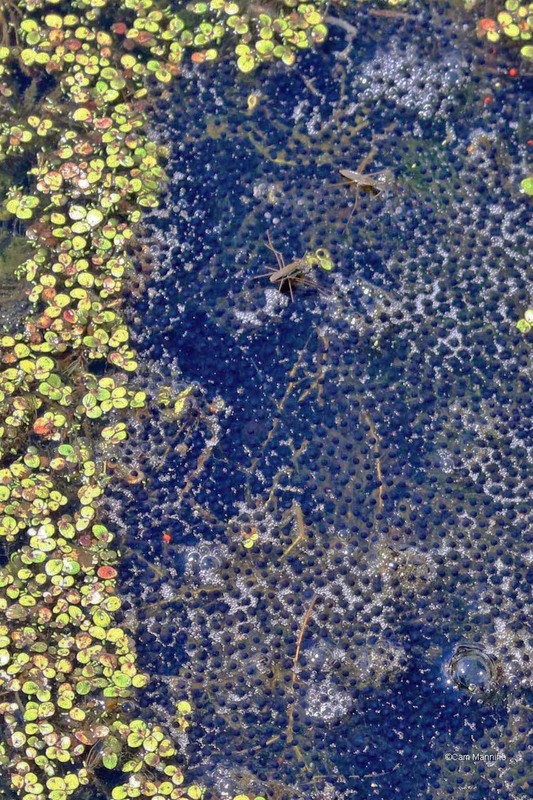 The numbers of the most successful park predator keep growing – and no, it’s not coyotes! 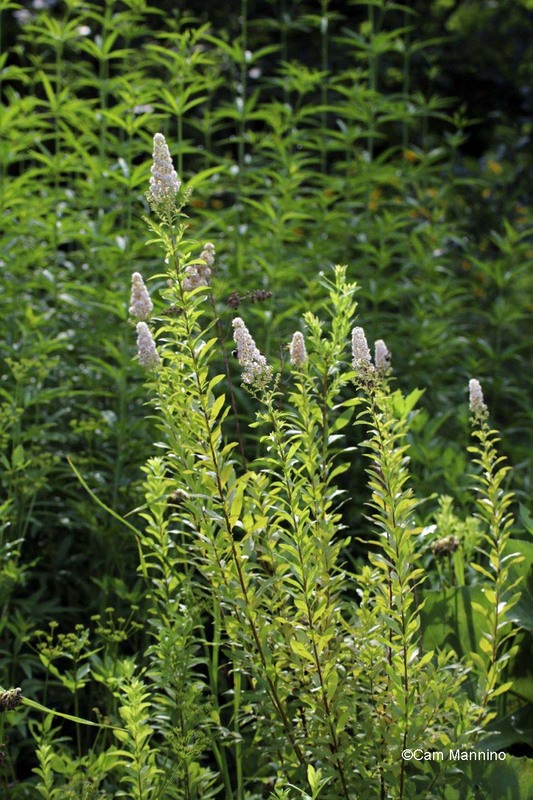 And native wildflowers love the second half of the summer (yes, we’re already there!) and are showing their colors everywhere you look. I have to begin with a nestling. 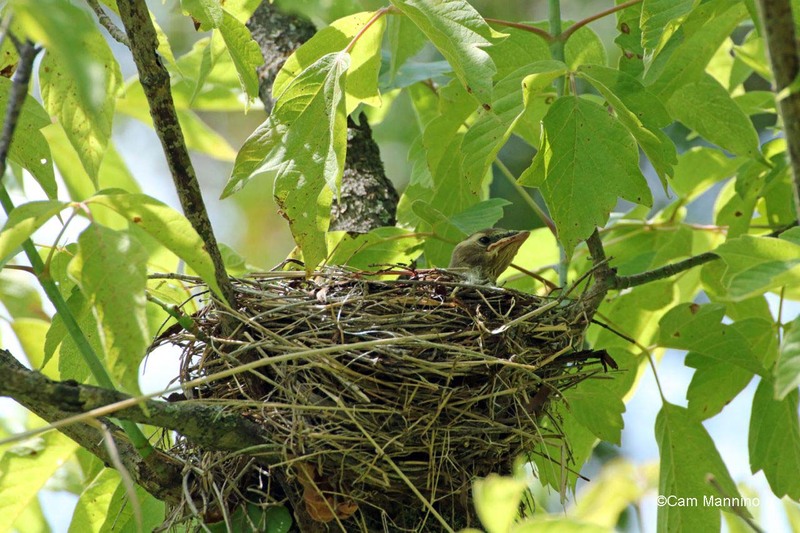 Remember the female Cedar Waxwing (Bombycilla cedrorum) on a nest from last week’s post? Well, this week her nestling stuck its little half-masked head above the nest edge so I got to see a Waxwing nestling for the first time! It sure doesn’t look like the elegant bird it will be in a few weeks! It’s still mostly mouth and that beak still looks soft, doesn’t it? A nestling Cedar Waxwing where I saw the adult female sitting last week. 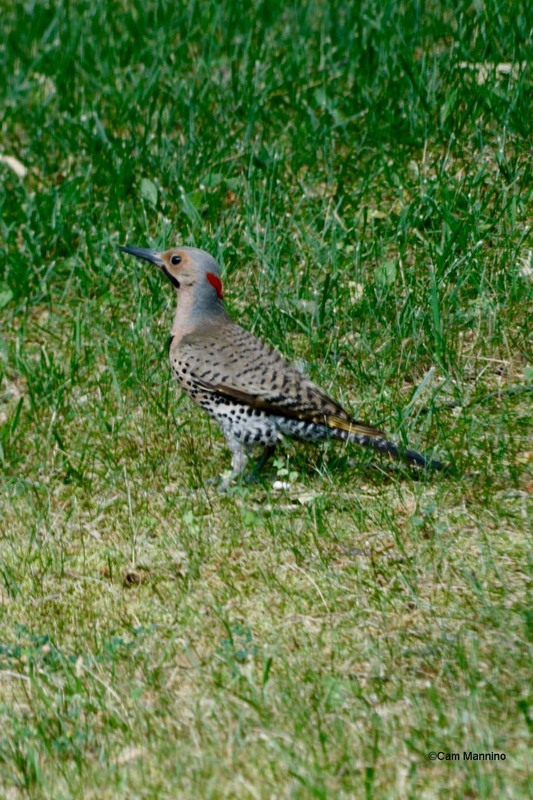 Amusingly, adolescent birds have the same awkward, gawky, not-quite-put-together look of a human adolescent. 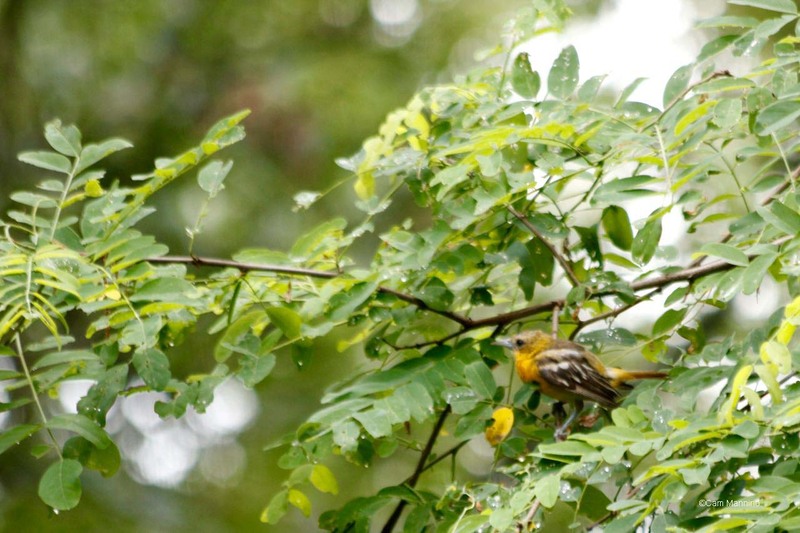 And like them, they seem to hang out together – this year, in the lane of Black Walnuts. 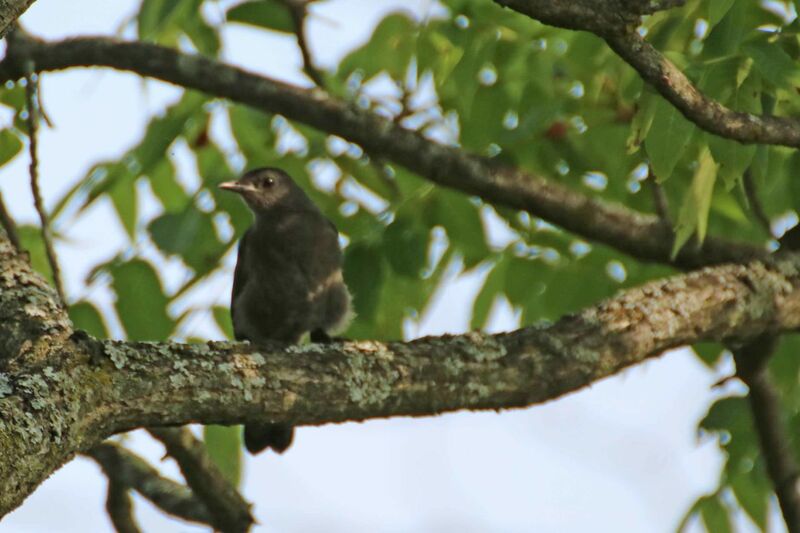 Here’s a juvenile Gray Catbird (Dumetella carolinensis), a bird which when it matures is sleek with gray feathers and a black cap. This youngster is in shadow, but you can see he still has downy fluff that makes him look a bit like he’s wearing baggy pants! 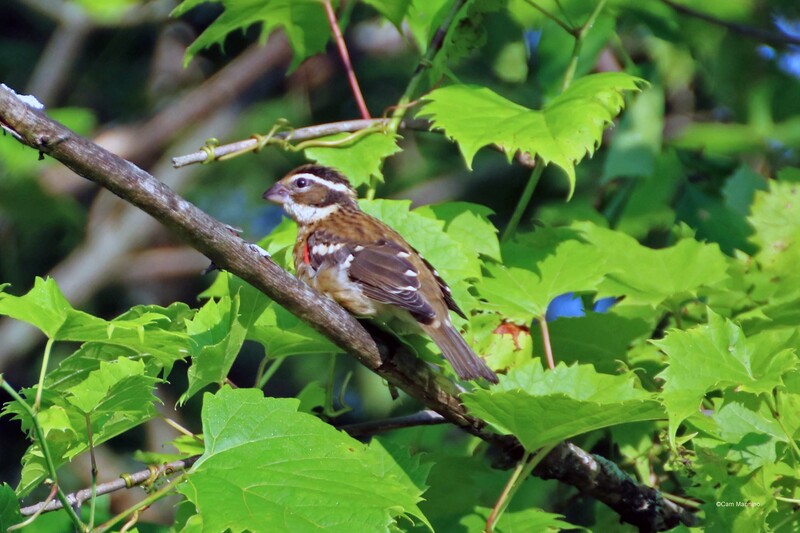 And here’s a young Rose-Breasted Grosbeak (Pheucticus ludovicianus). 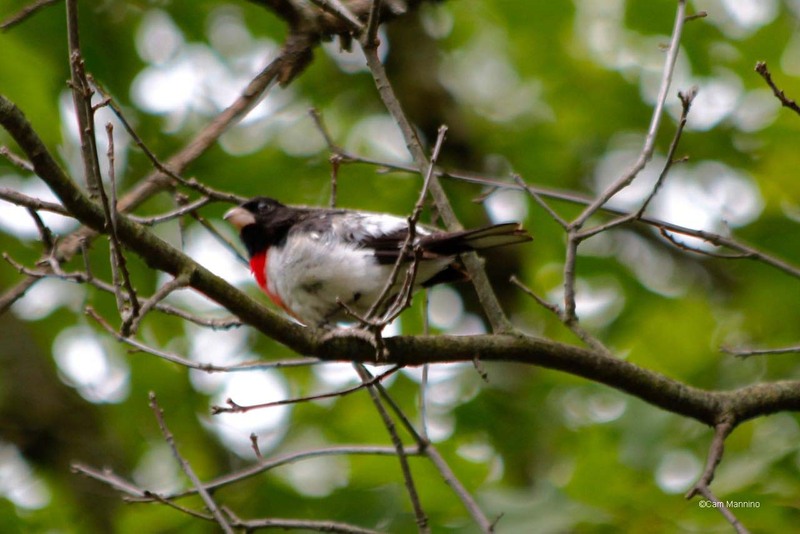 The juveniles look like their brown-and-white mothers, but I believe that little red dot under this one’s wing tells you it will eventually look like the stunning male at this link – black and white with a hot pink bib at his throat. 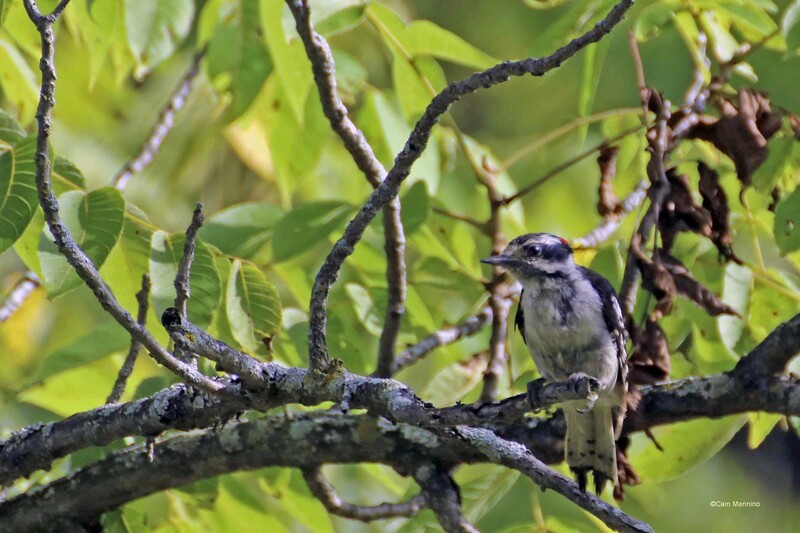 This young Downy Woodpecker (Picoides pubescens) looks a bit scraggly, but seemed to be finding all kinds of things to peck at or eat on a walnut tree. I’m thinking it’s just a gawky adolescent. This juvenile Downy Woodpecker hasn’t quite got the finished look of an adult and is still learning how to find food. Look at the lovely pattern its wing made as it flew off. 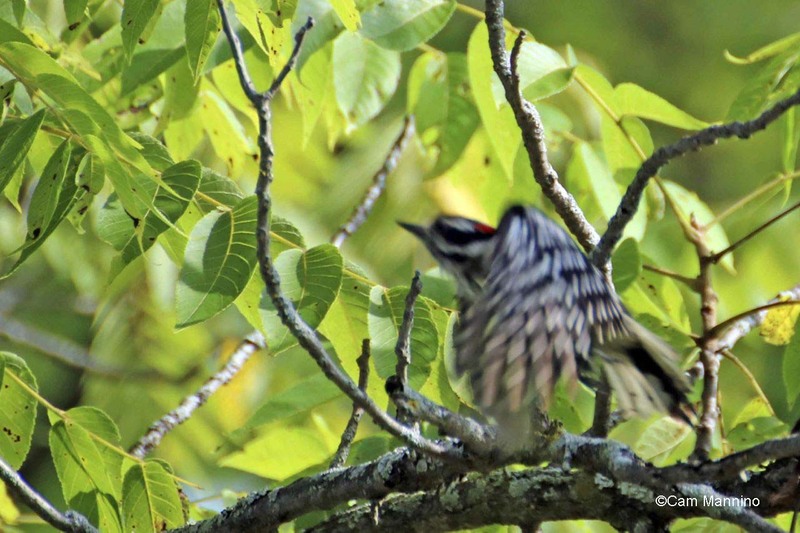 The wing of a young Downy Woodpecker produces a beautiful pattern as it takes flight. 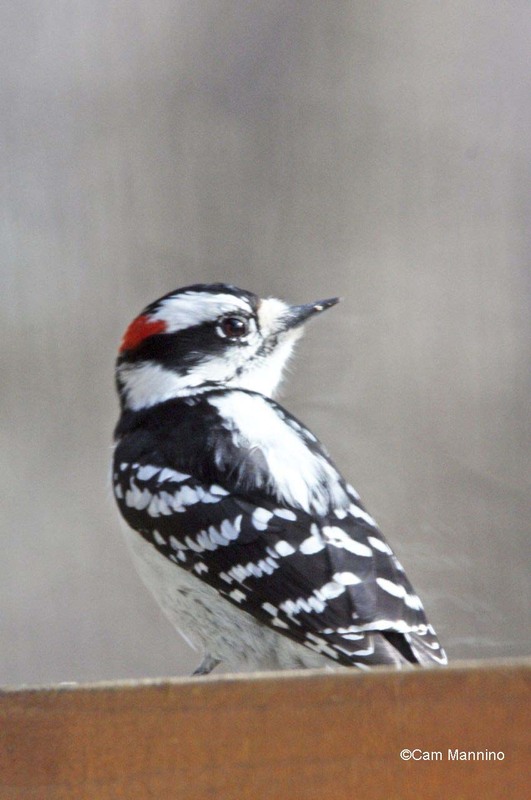 And here’s a home photo of an adult Downy to show how much more “together” an adult downy can look! An adult Downy Woodpecker looks a bit less at loose ends than the juvenile..
By the way, if you live in a house with wood siding as we do, you may be frustrated by a male Downy drumming on your house. According to Cornell Lab, the Downy isn’t feeding, which means you don’t have bugs in the siding. This is the Downy’s way of singing; it uses percussion to attract a mate. Of course, they’re still making holes in your wood! New Fierce but Fascinating Predators Arrive at Bear Creek! I’m referring, of course, to Dragonflies. 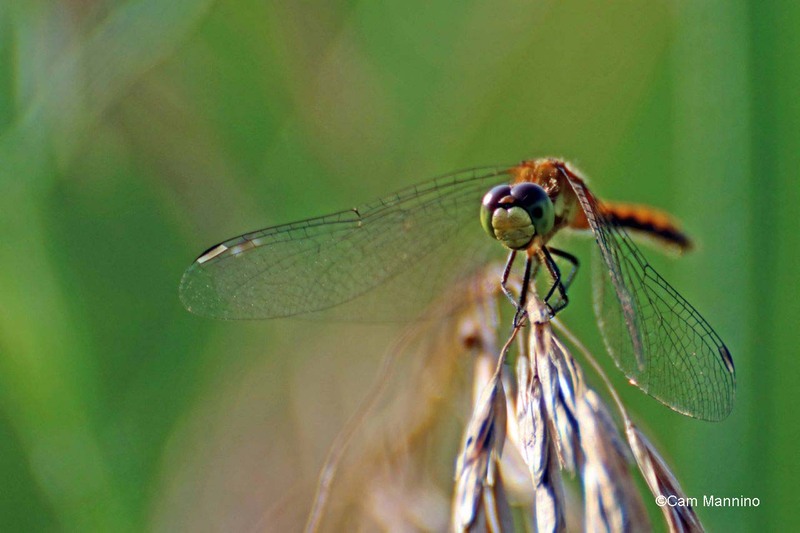 Right now, the BIGGEST of these drone-like insects, called “Darners” (after the large needles), are hatching out of the ponds and patrolling the fields of Bear Creek. 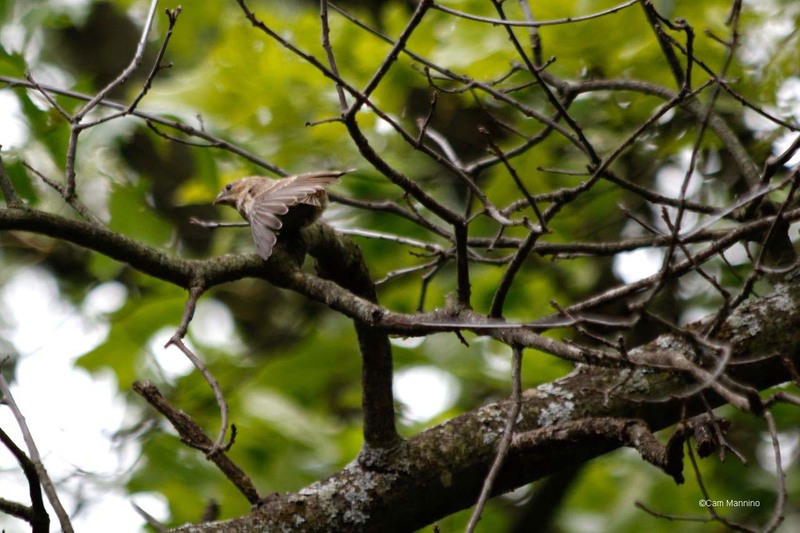 They can be three to five inches long and have a wingspan slightly larger than their body. I’m quite confident that this is a Lance-tipped Darner (Aeshna constricta ) we saw Sunday along the western sloping path. 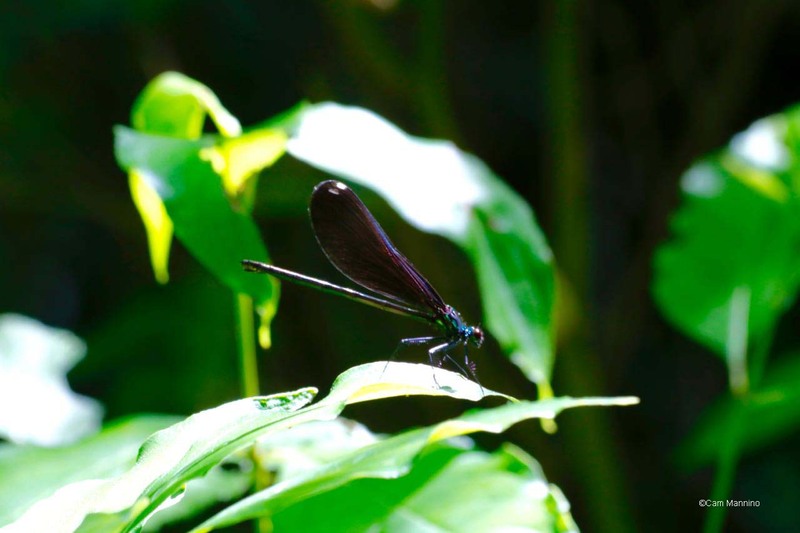 Dragonflies are notoriously difficult to identify, however, so feel free to correct me! 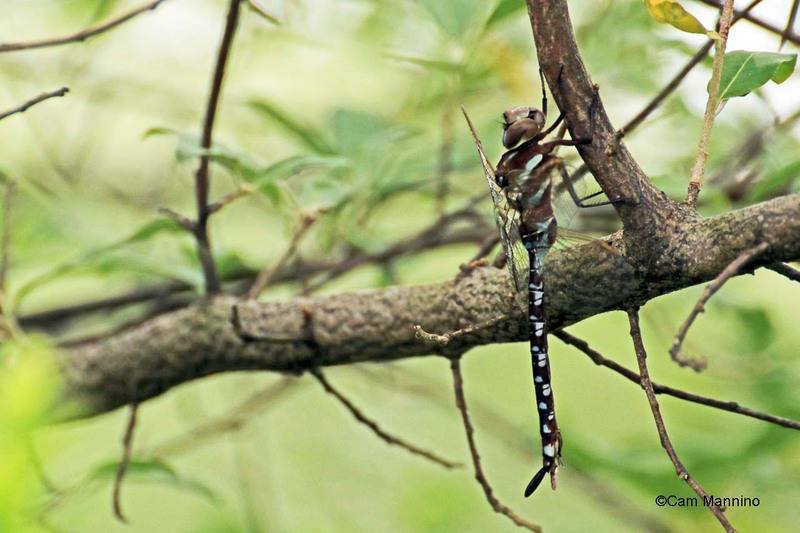 The Lance-tipped Darner is a large dragonfly and like all dragonflies, a wildly successful predator, catching 95% of its prey which, happily, includes mosquitoes! I’m quite sure that I saw a Swamp Darner (Epiaeschna heros) zooming over the Old Field off the eastern path earlier this week. 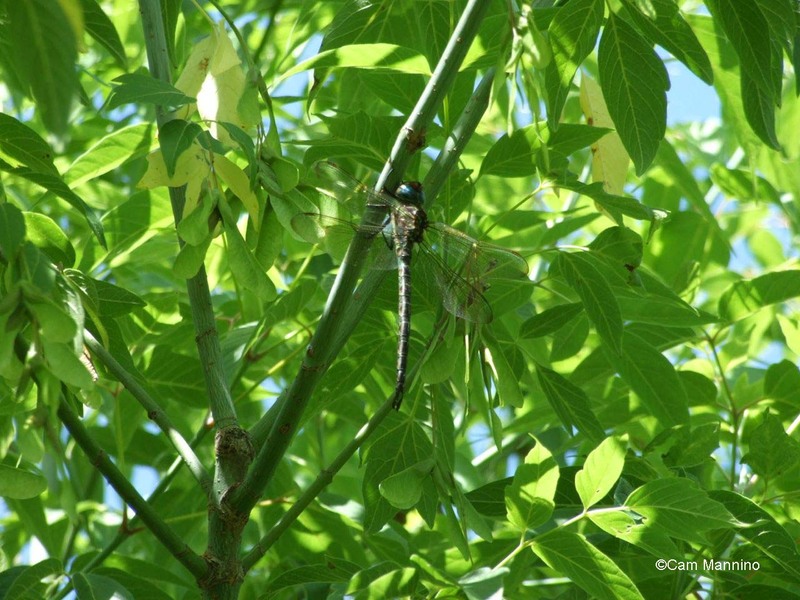 Here’s a photo of a non-zooming Swamp Darner from a couple of years ago. 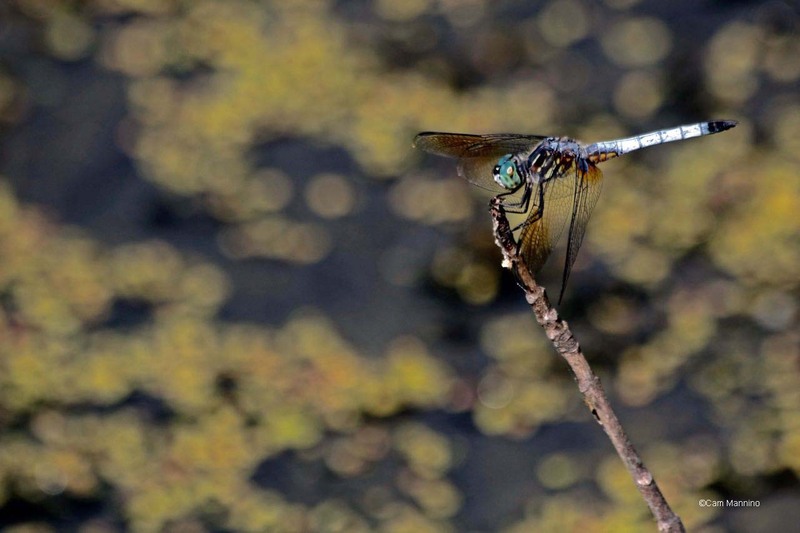 Watch for this Swamp Darner who usually appears at the end of July or early August. A White-faced Meadowhawk dragonfly stares me down with its giant eyes which can see you both when heading toward you and flying away from you! 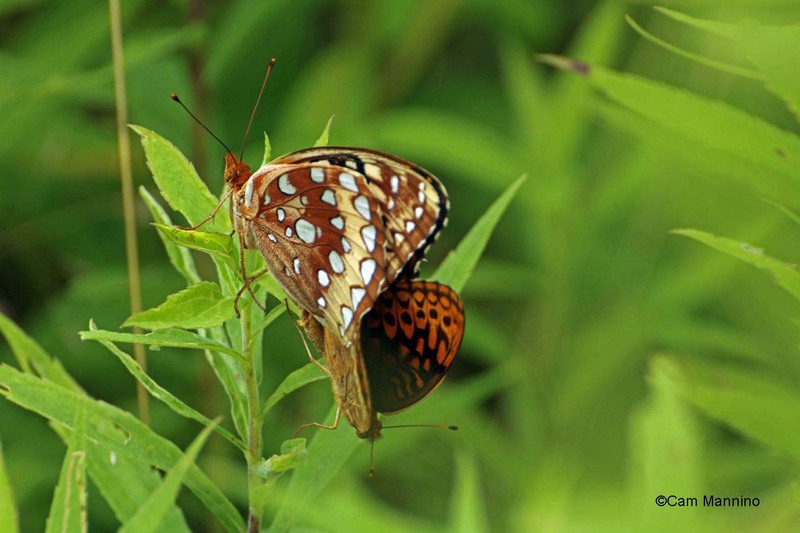 On a sweeter insect note, we also were gifted with the sight of two Great Spangled Fritillaries (Speyeria cybele) mating. We couldn’t determine which gender is larger, but there is quite a size difference! 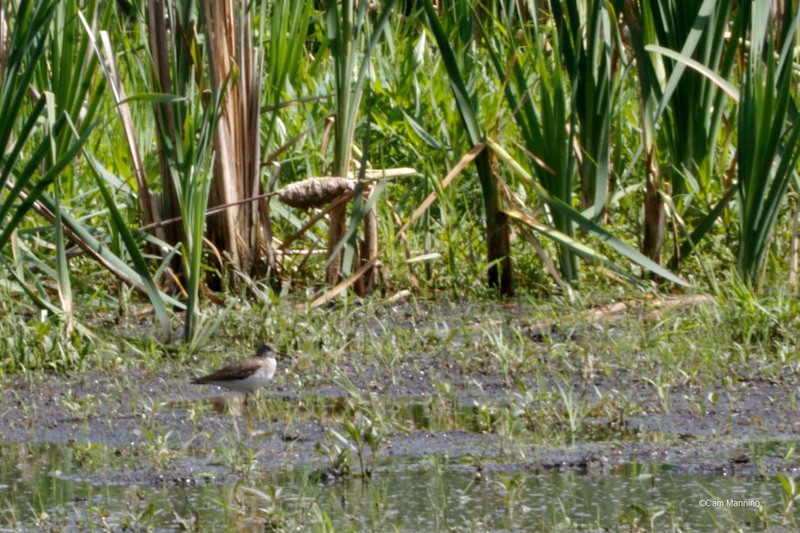 Here are two photos, as they synchronized opening and closing their wings. 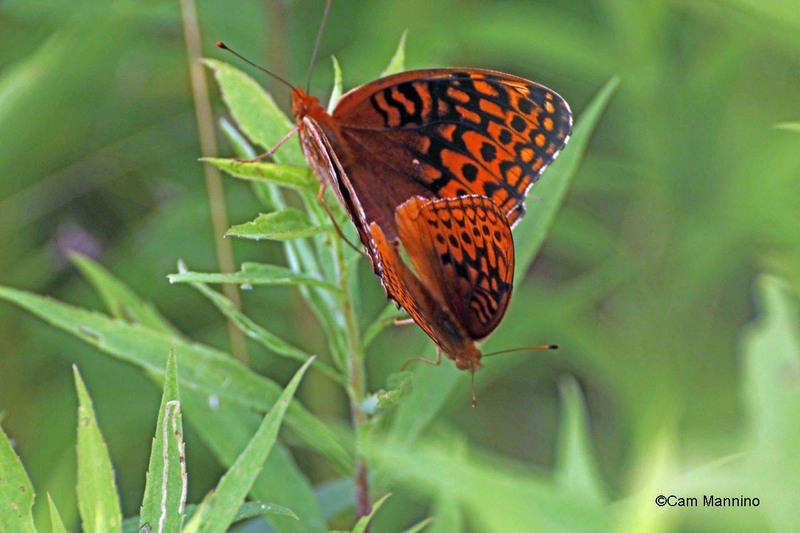 The Great Spangled Fritillaries synchronized the opening and closing of their wings while mating. 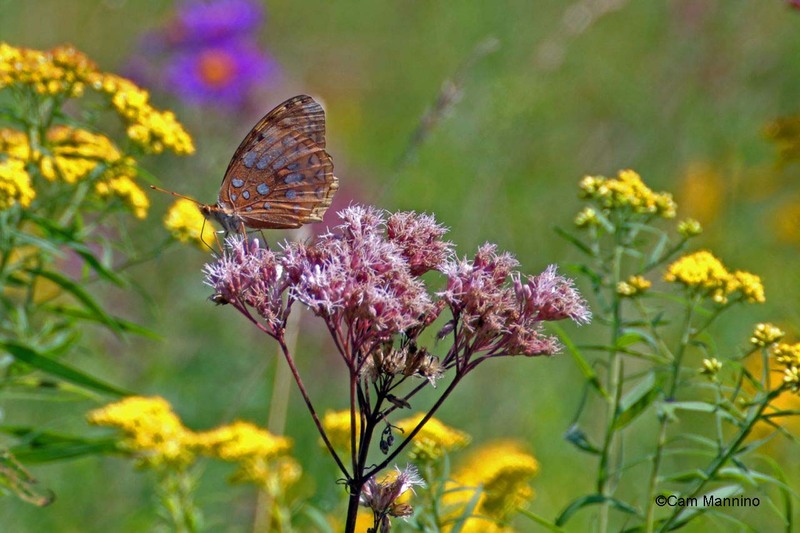 The second half of the summer ushers in a big bloom of native wildflowers. 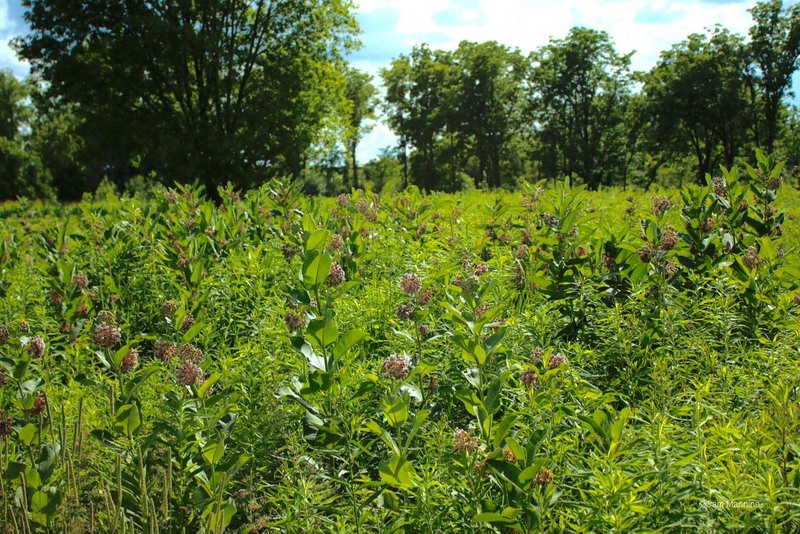 In the hot sunlight of high summer, prairie flowers flourish, since long ago, much of Oakland Township’s land was prairie. 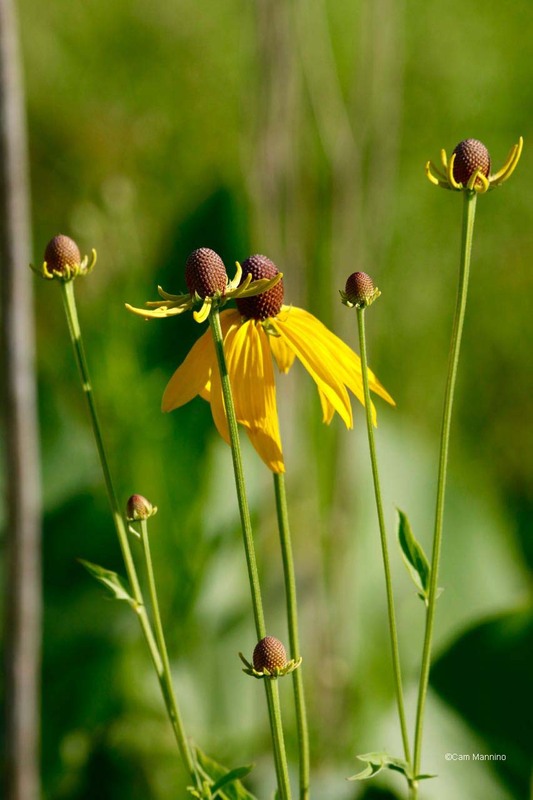 I recommend bringing your lunch, sitting on the hilltop benches at the south end of the park, and just enjoying the Yellow Coneflowers (Ratibida pinnata) as they sway in the wind. 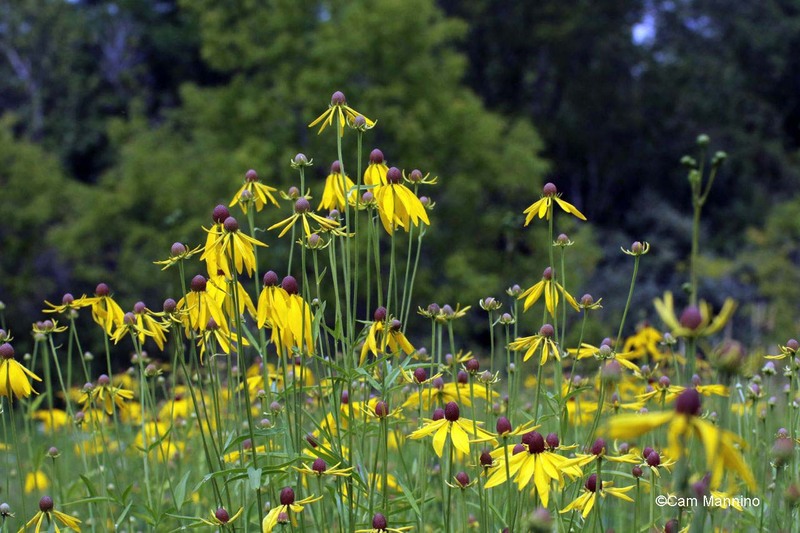 Native Yellow Coneflowers encircle the benches on the hilltop at the south end of the park. 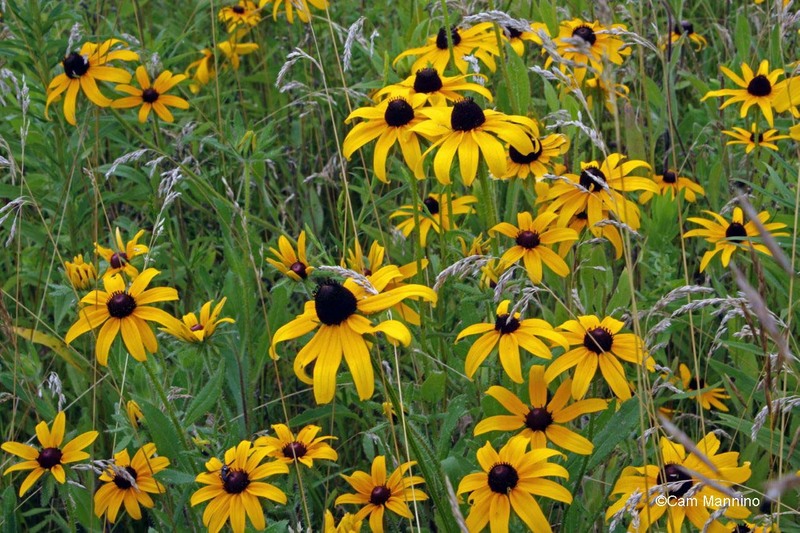 And right across the path, another native, Black-Eyed Susans (Rudbeckia hirta) bloom in happy profusion. 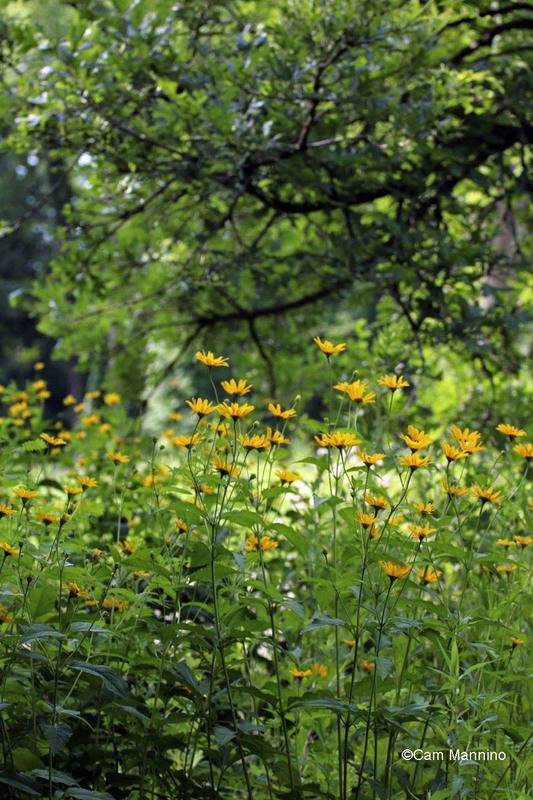 Black-eyed Susans are sometimes confused with Yellow Coneflowers – but now you can compare the two plants near the hilltop benches at the southern end of the park. 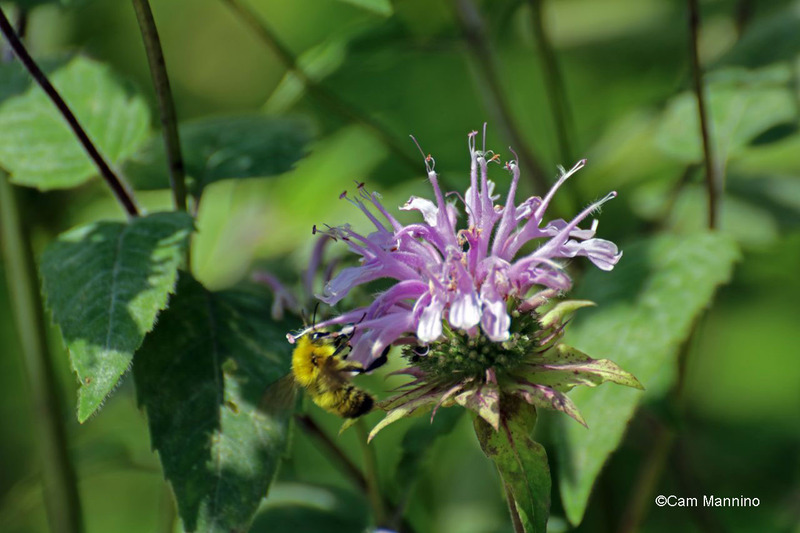 Large lavender swaths of Wild Bergamot (Monarda fistulosa), also known as Bee Balm, keep company with these other two. This wildflower is certainly a “balm” to bees since you rarely see a group of them without seeing bees busily probing the hearts of these fun, “bad hair day” flowers! 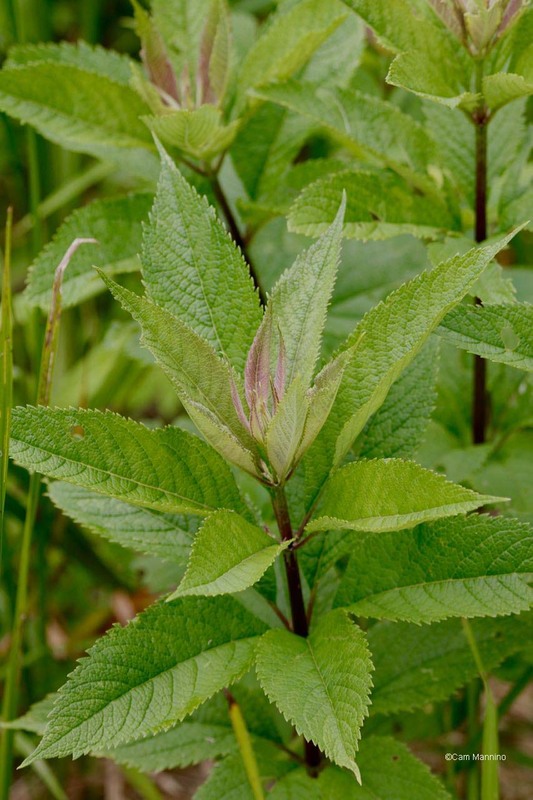 Like the native plants I mentioned last week, Bergamot has been considered a medicinal plant and was used as an antiseptic by Native Americans. 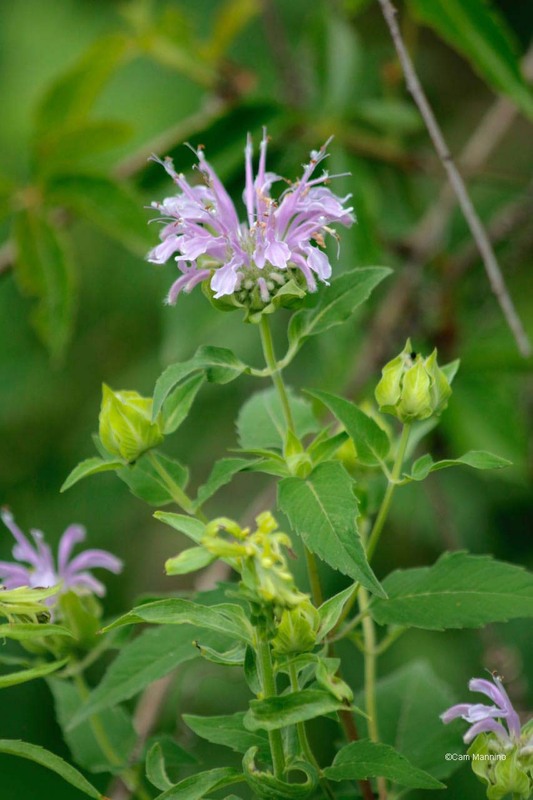 Wild Bergamot lives up another of its names, Bee Balm. 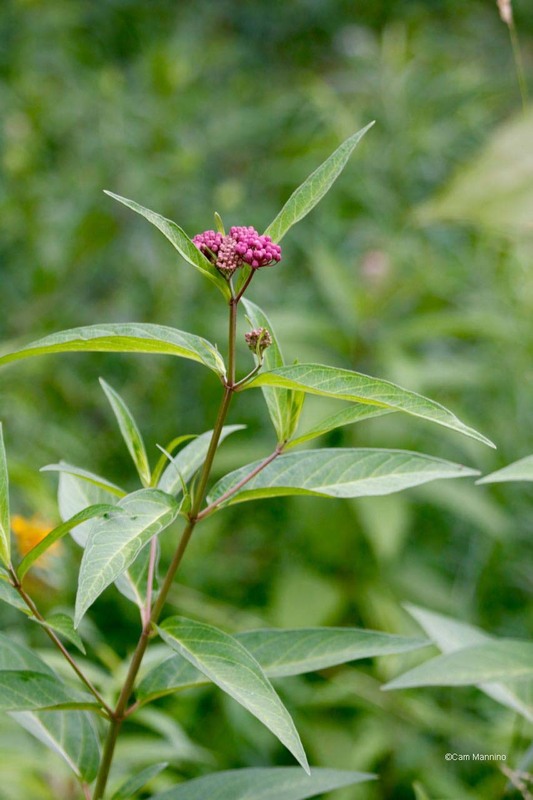 CAUTIONARY NOTE FROM OAKLAND TOWNSHIP PARKS AND RECREATION: DO NOT pick or consume wild plants in our parks. 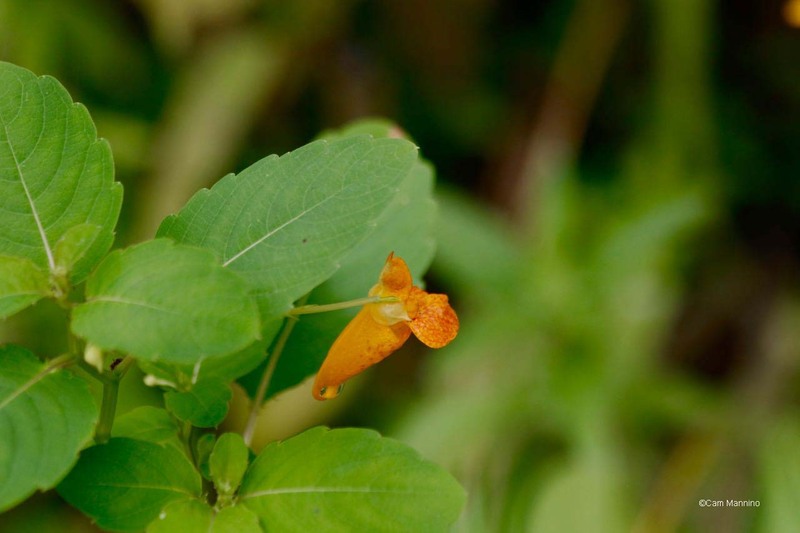 In addition to being potentially poisonous, many wild plants are endangered because of over-harvesting. 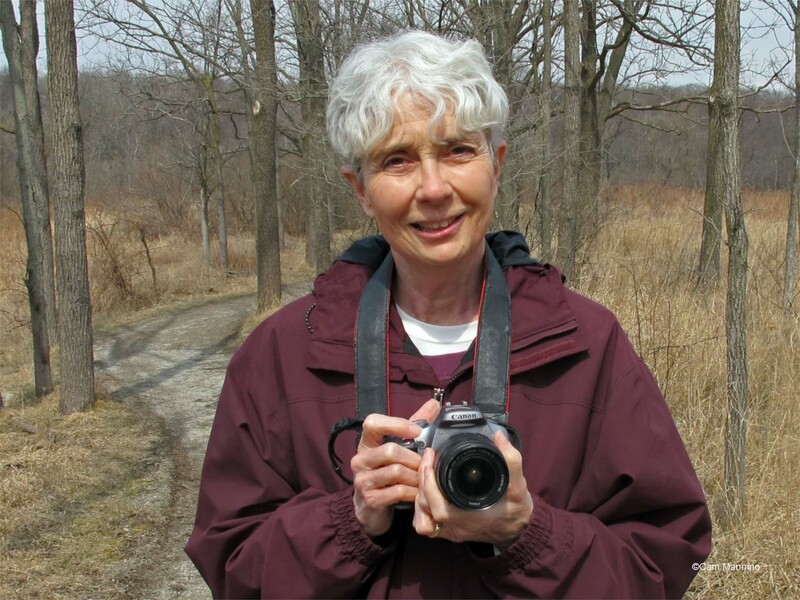 Oakland Township ordinances prohibit removal, destruction, and harvesting of plants within parks. 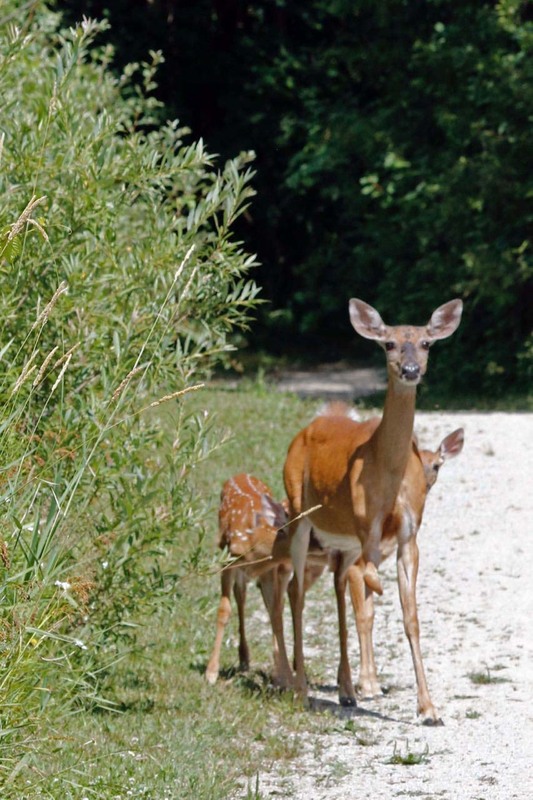 Leave plants for wildlife and other park users to enjoy! In the native flowerbed near the shed, some glorious plants are blooming for your enjoyment as well. Look at these lovely native False Sunflowers (Heliopsis helianthoides). False Sunflowers shine gold in the sunlight against the shade of trees near the shed. 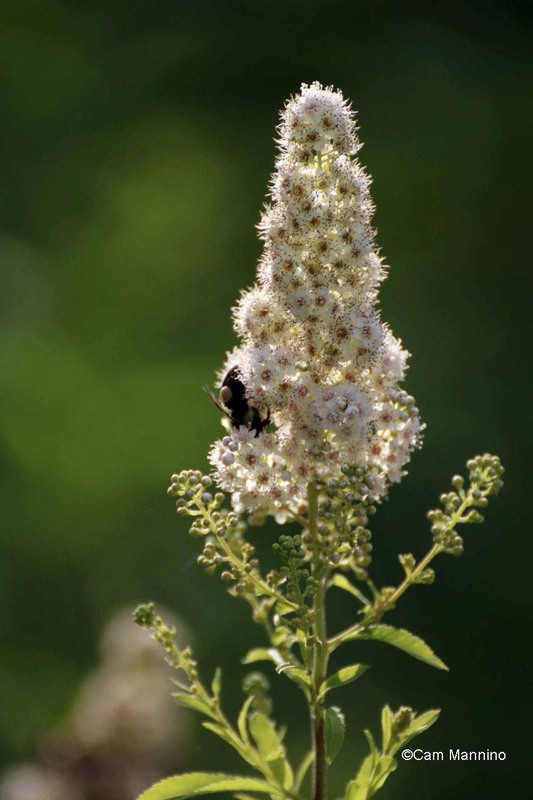 And tall plumes of native Meadowsweet (Spiraea alba), standing in the sunlight, hum with pollinating bumblebees. 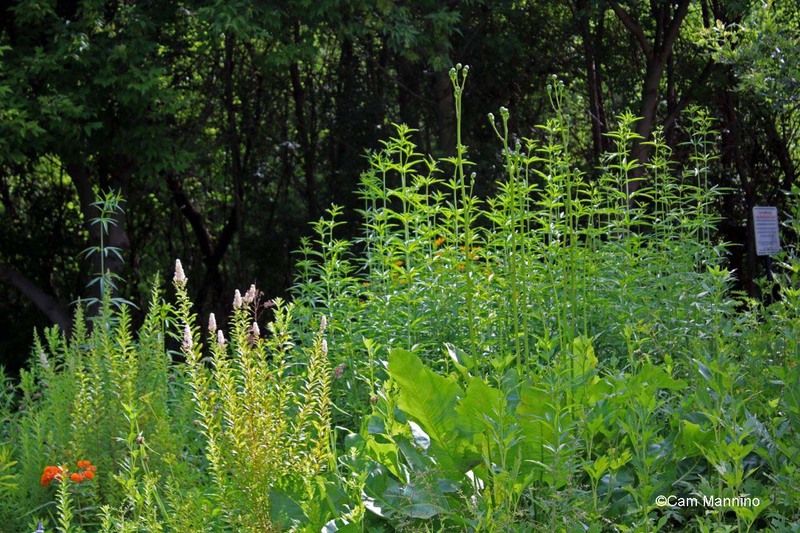 Tall plumes of native Meadowsweet sway in the sunlight in the native flowerbed near the shed. Native meadowsweet is a perfect spot for a bumblebee carrying a load of pollen. 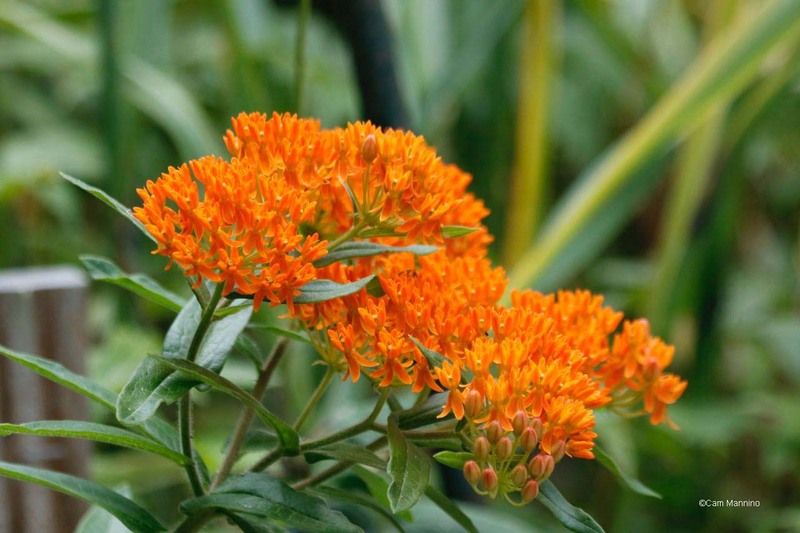 Nearby, a native plant with an exotic flower also grows tall in the flowerbed by the shed. 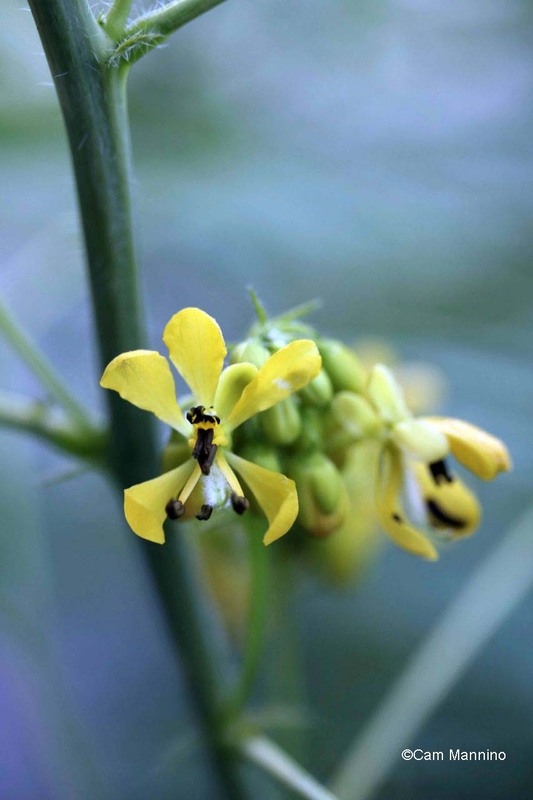 It’s Wild Senna (Senna hebecarpa) and with a flower like this, it should be called wild! The exotic-looking flower of Wild Senna growing in the native flowerbed by the shed. And look how they grow in profusion along the stalk of the plant! 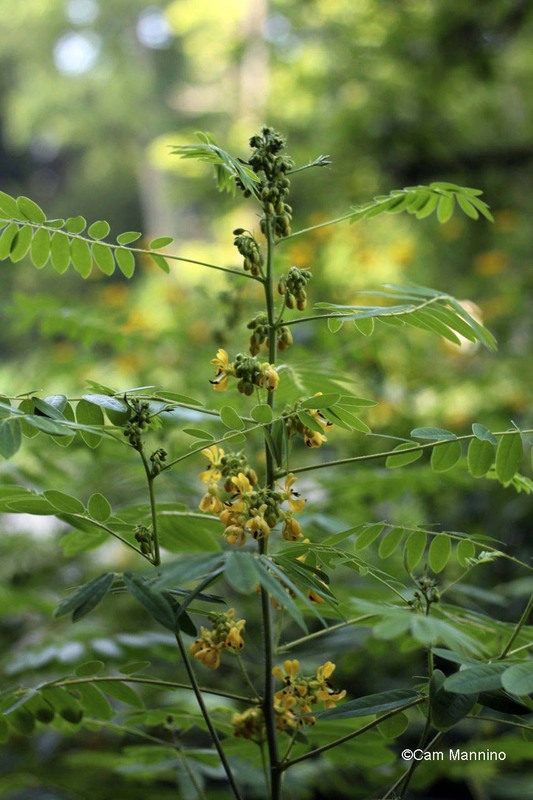 Wild Senna produces lots of blooms right next to the stem. And here’s one last exotic-looking native shrub that I’ve always loved. 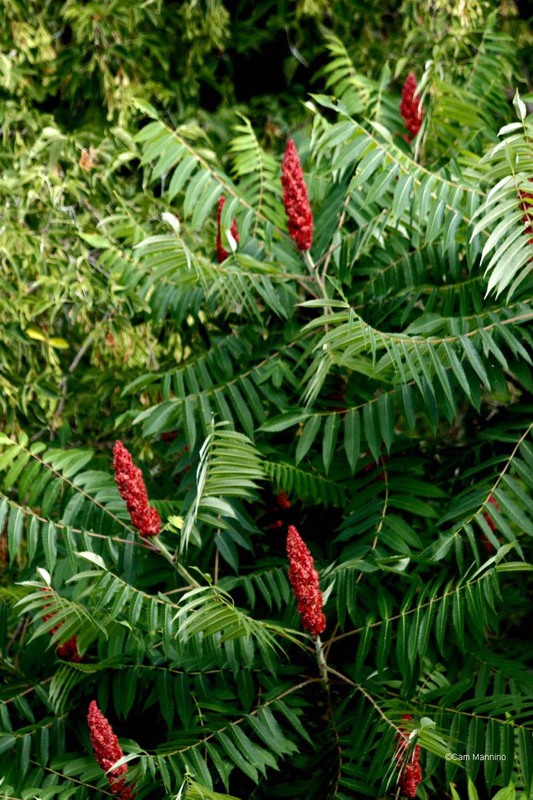 My parents backyard which backed up to the Paint Creek Cemetery used to be full of native Staghorn Sumac (Rhus typhina) which always looked to me like it belonged in the tropics! No, it’s not poisonous. Here’s a link where you can see that Poison Sumac looks completely different and lives in wet areas, unlike this sumac that is at the edge of the woods next to the western sloping path. 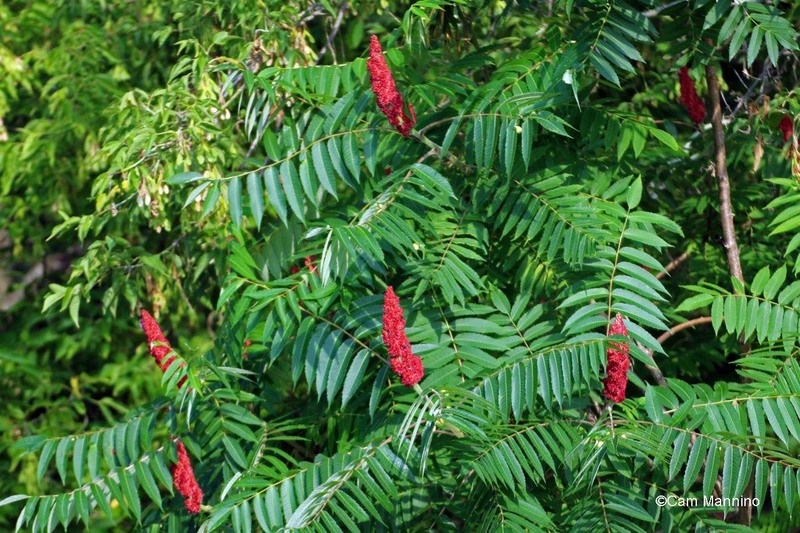 A native shrub, Staghorn Sumac is a beautiful and benign plant. One of the tallest native wildflowers is just barely starting to bloom among the Yellow Coneflowers at the top of the southern hill. 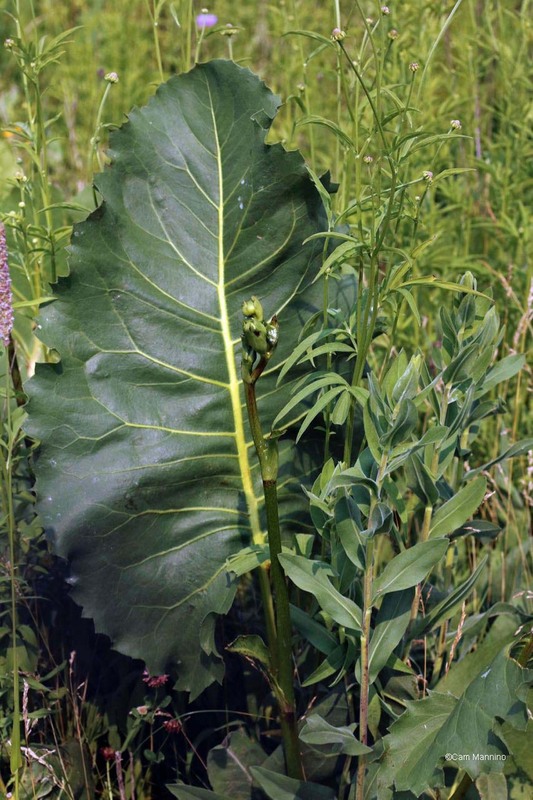 Prairie Dock has HUGE leathery leaves and can reach 10 feet in height. You can see the tall stalk with its round buds towering over the other plants in the sunlit native flower bed near the shed as well. Prairie Dock towers over the other plants in the native flowerbed near the shed. Those huge, leathery leaves in front are prairie dock plants as well. Here’s the first beginnings of a bloom out by the benches on the southern hilltop. 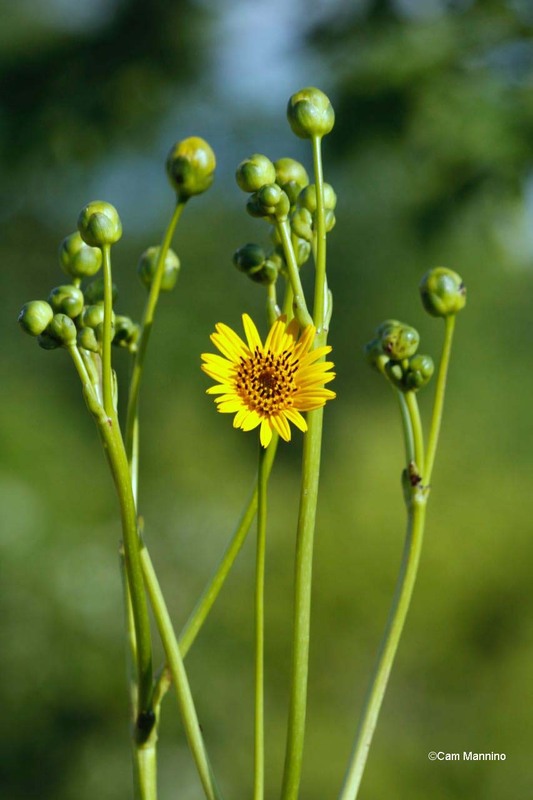 Prairie Dock begins to bloom at the end of its gigantic stalk, the tallest wildflower in the park. 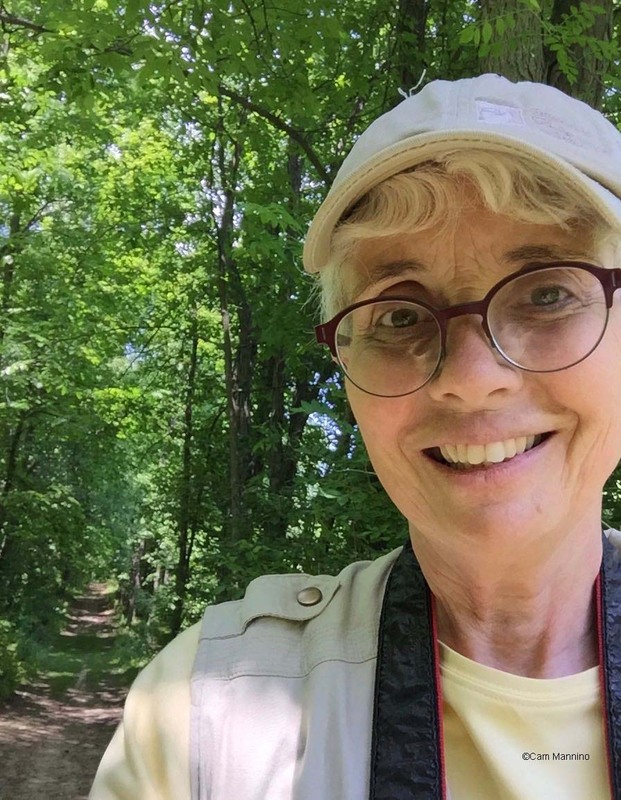 So bring a lunch and/or a friend and hang out with the avian adolescents on the lane this week or simply sit on the benches at the top of the southern hill and watch the Yellow Coneflowers sway and listen to the hum of bees in the Bee Balm. 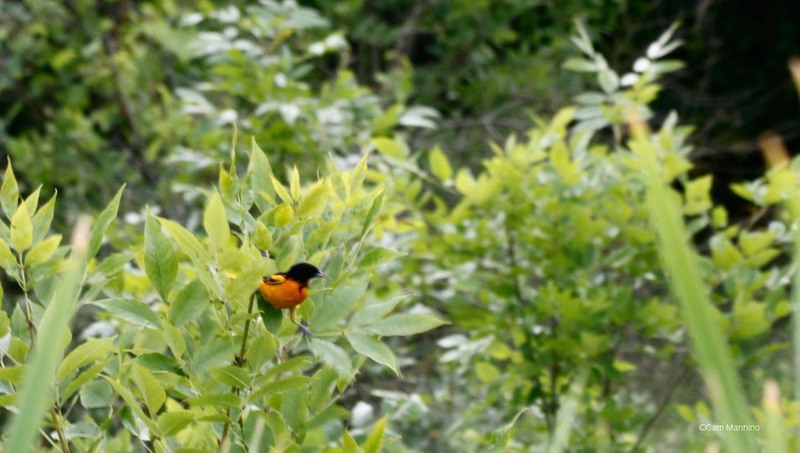 You deserve to nourish yourself with a lazy afternoon at Bear Creek Nature Park!